I'm printing with red PLA in an Ultimaker 3 Extended. 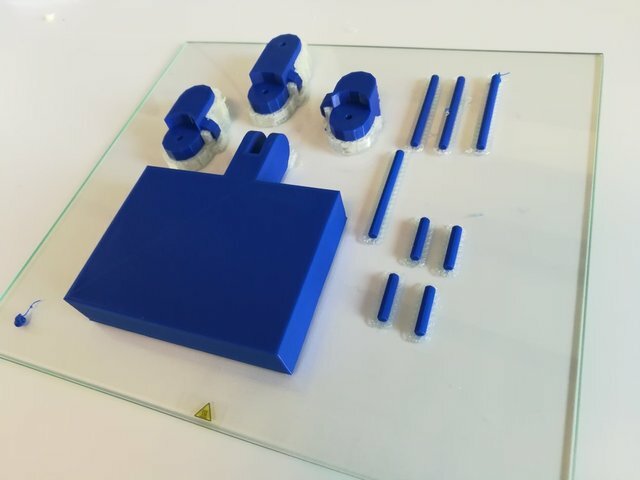 I have printed with other types of PLA, green, blue and transparent and i haven't got problems to print. 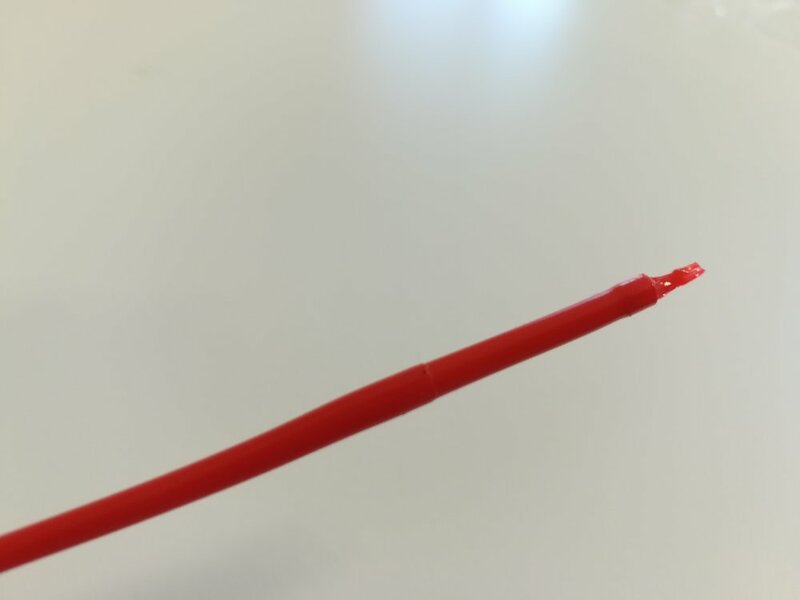 But now when I'm printing with red PLA I'm having some problems. I'm using similar parameters in CURA that I used in other pieces of PLA and I obtained good results, even I have used the same gcode in fifferent occasions and once i have problems and other times this not occur. I don't know why this widening is produced and why reason the print cores don't extrude material. I don't know if for some reason the extruder get blocked and while the feeder continues pushing the filament into the print cores appear this widening or if this may be a problem in the filament that no allow enter the filament in the print core. What can produced this anticipated or this drip? At the same teperatures with other PLAs I haven't got this problems. It would be helpful if we knew you layer height, print speed and extruder temp. Is all your PLA from the same supplier, if so who; if not where did the red PLA come from. 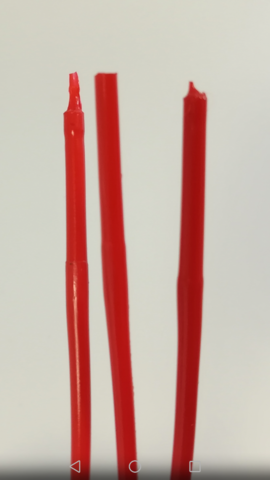 I read your commets as saying that for all your other filament everything is OK - it is just the red filament. You are suffering bad under extrusion. Your 2nd pic shows the result of your drive wheel trying to feed the filament through the Bowden tube but the filament is sticking and the wheel teeth are grinding down the filament. I am not sure about pics 3 & 4; is the thickening causing the sticking or is it caused by the sticking I wonder? So what is happening? Well it as all other PLAs are working it is safe to say, I think, that your drive system is fine. Also that you have no material stuck inside the nozzle; but with the problem you are experiencing it is always a good idea to do a few atomic pulls to make sure the nozzle is clear. 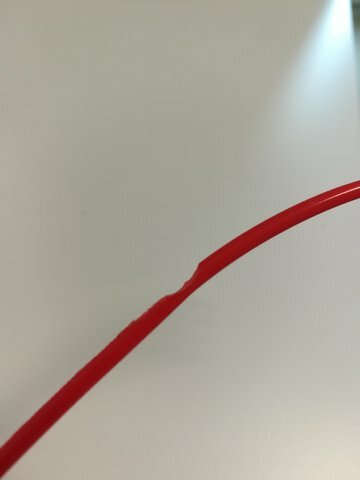 To me it seems that either your red filament is faulty (i.e. not a consistent width and being fat in some places which is causing the sticking) - which is why it be helpful to know your filament manufacturer(s), or you at printing it too cold. All filaments, even if from the same manufacturer, are different and it may be that their optimum settings will differ but normally you should be able to print different colours with the same settings - this is why knowing your settings would be helpful, you may just be on the edge and the red is pushing you over it - probably unlikely but we do not know without the info. My guess at the moment based on your info above is faulty filament. Can you measure your filament diameter, back from the drive unit towards the reel for a metre or two, say 10+ measurements. It should be 2.85mm +/- 0.05mm; anything 2.95 and above is suspicious. The PLA is a Ultimaker filament. I have mesured the filament diameter after the problems and, now, this is correct, the diameter is between 2'80 - 2'85mm, but I don't know if the diameter of the filament was greater in the moment that problems appeared and this causes blockage in the print core because the material does not enter, and then the drive wheel grind the filament or if there is another cause that block the nozzle and then the thickening appear due to the high temperature near the print cores and that the drive wheel contiue pushing the filament. There are any way to predict when this may occur? This is important because these problems waste a lot of time. with inicial and final temperatures (when change the extruder) 5ºC under the print temperature ( 195ºC when I print at 200ºC, etc...) this is somewhat higher than the predetermined temperatures that appear in CURA when you set the print temperature. Have you checked if the little fan to cool the nozzle is running (when above 40°C)? It could get stuck if hairs of filament get into it. If this fan is not running, heat may travel up too high in the filament, soften it before the nozzle (which causes it to expand due to the feeder pressure), and thus preventing it from entering into the nozzle. This could explain all other phenomena too (although there might still be other causes of course). In the UM2 you can see that little fan from the back, but in an UM3 I don't know. Well you are certainly not printing too cold! This differs from printer to printer so treat this ONLY as a guide but I would print .200 at 30 or 40mm/s at 200 and I printed .300 at 60mm/s at 210 - maybe cooler but I printed at 60mm/s, after 4 years, for the 1st time last week and it was fine. To note; if important you will get normally better surface finish if you set your 4 print velocities to the same speed. Each time you change speed you will get a pressure change in the extrusion system which takes time to equalise and can result in artefacts being deposited on the surface. The only time I have a difference is if I have a piece with a large surface area and printing infill at a slow speed would be tortuous. In which case I will print at least 3 walls (possibly overkill), walls before extrusion and inner walls before outer wall; the goal being to let the inner walls take the impact of any artefacts when slowing infill speed down to wall speed. Sorry I digress; thanks for the detailed response. @geert_2 point is a good one, I had not thought of that. It is possible, as you say, that you had some faulty filament there but have now gone past that and are back to good filament - that has happened to me, although subsequently I did hit bad filament again on the reel. So perhaps not likely but certainly possible. From what you say (apart from checking the fan) everything looks good; I think I would proceed as follows 1. do several atomic pulls, doing several is important because doing one and finding it clean does not mean that everything has been dislodged. 2. 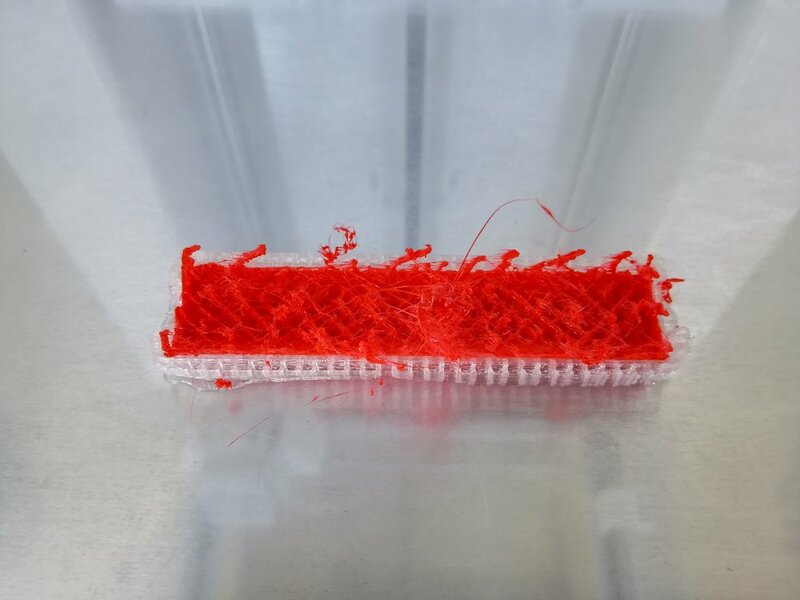 If you know how/are comfortable with it, then remove your extruder and take the nozzle off and check inside the extruder to make sure there is nothing deposited on the inner wall of the shaft. 3. Run the printer for several hours using your other filament. 4. Cross your fingers and try the red again. 5. send us a smile or update us on the problem. The fan works correctly at all times. I have printed with red PLA again and I haven't got problems in 4 pieces, but the problem of non extrusion return again, I saw that and I stopped the impression when this happened and unload the filament, this time no appear widening, so the widening is produced by the heat of the printcore while the drive wheel push the filament into the printcore. Imeasure the diameter of the filament and this is about 2.80mm, it is right. I think that I have a defective filament in its composition or it has some impurity that obstructs the nozzle or causes the material not flow well and clog the nozzle finally. Now I changed the filament to green PLA and I haven't got this problem. 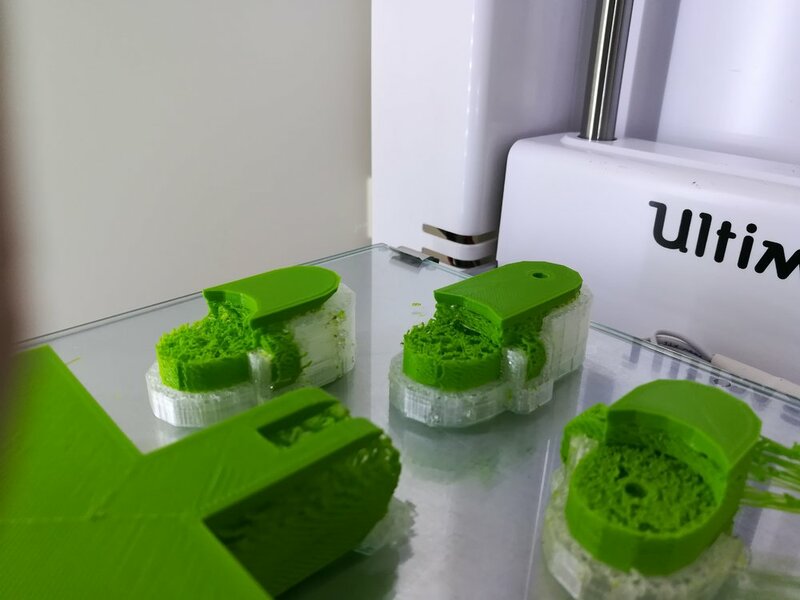 Ok, I have had the same problem another again, this time with green PLA in Ultimaker 3 Extended. At some point during the printing no material is extruding correctly and the final appearence of the piece is bad and have big gaps in the walls and infill. In this piece I have used parameters that gave good results other times. It's strange that when I have printed with the same g-code other printer, an Ultimaker 3 I obtain good results. The problem of no extrusion of material appear some times in my Ultimaker 3 Extended but I dont know what is the reason, I clean the print cores the day before this print. 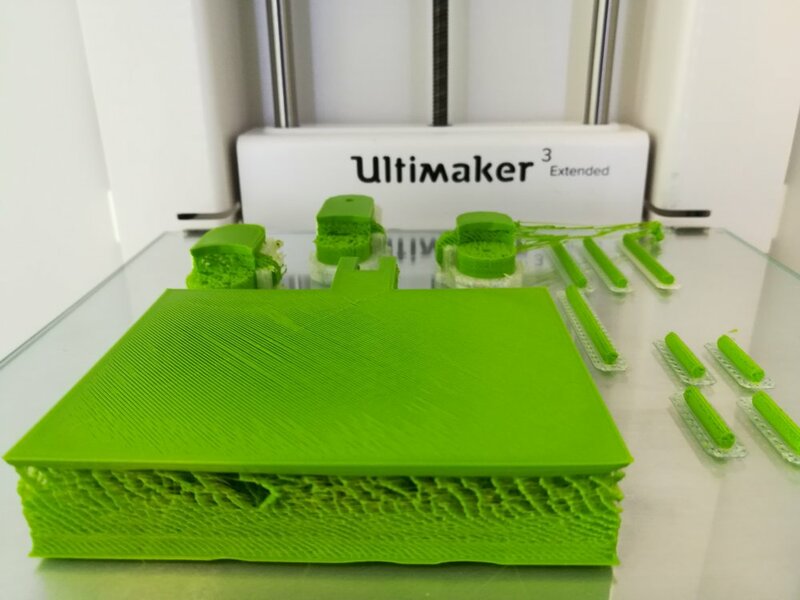 During the print with green PLA the drven wheel wear the filament but this time the diriven wheel managed to push the filament finally and the extrusion continue and you can see that the upper layers are good like in a normal print. I have cleaned the feeder and the bowden tube because they are full of plastic chips due to the wear of the filament. After clean the feeder and tubes I have printed other piece and no hava had the problem. 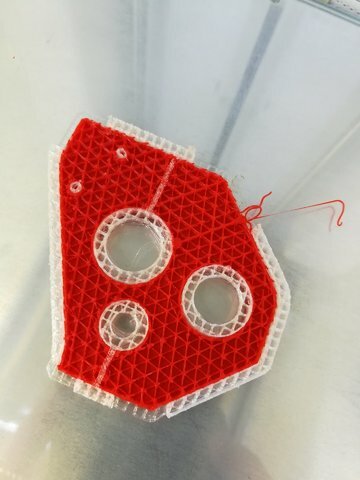 Can someone help me saying wich may be the problem in mi Ultimaker 3 Extended that produces no extrusion of material sometimes and final appearence like the upper images? I am still thinking in the direction it must be something mechanical, or basic electrical. Like the little ventilator sometimes getting stuck or sometimes having a bad electrical contact (but not always); filament on the spool getting stuck under itself; the spool not rotating freely and getting stuck; partial nozzle blockage due to debris picked up or due to burnt filament particles; kinks in the filament that increase friction too much in the bowden tube or nozzle; bowden tube pinched; or something similar along that line? That is where I would search. But I have no UM3, so this is all "educated guessing". Bad settings and bad gcode should show up always the same. And bad heaters or temp sensors should or be compensated for, or go totally wrong and give errors, due to the closed-loop circuit trying to compensate. A slipping feeder wheel (if that is possible at all?) should not grind filament. This all provided that you print from the USB-stick. If via network, I have no idea what a slow network or slow host computer (doing defrag, playing a Youtube-video, or running antivirus) would have as effect on the print?